Is there a more excellent stoner food then Nachos?!?! I think not. They're crunchy, salty, cheesy, full of flavor and topped with sour cream. AND you get to eat them with your hands! Plus, they're quick and easy to make. 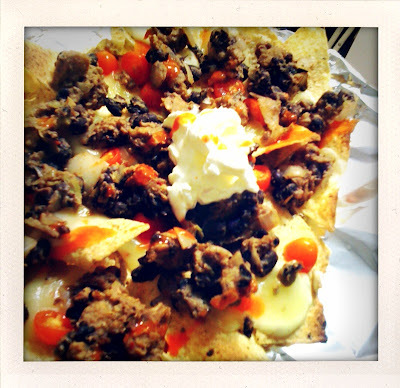 My only problem with nachos is that they tend to get soggy and difficult to eat after a few minutes, but I think I've got that bit figured out by heating up the soggier toppings separately and adding them at the end. Preheat oven to 350 F. Saute onions and garlic in oil or butter in a frying pan over med-high heat. Add ground sausage and cook for 5-10 mins. 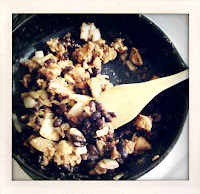 Add black beans and chili powder and stir in until entire mixture is hot. (I happened to have some chipotle hummus in the fridge and I added about 1 tbsp in with beans). Keep this mixture warm as you prepare the chips. Place the chips on aluminum foil on a baking sheet. Place cheese, tomato and banana peppers on top of the chips. Place in oven and watch closely-- 5 to 8 minutes is all it should take to melt the cheese and slightly brown the edge of the chips. Transfer the chips on aluminum to a plate and add spoonfuls of the bean and sausage mix. Finish with a dallup of sour cream in the middle and hot sauce to taste. 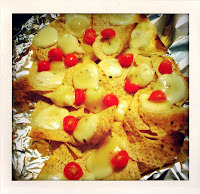 mmmmm I'd love to have some nachos right now!